Bullion has risen more than 20 percent since the start of 2016. Given the yuan's still-limited convertibility, it has its limitations as a reliable reserve for foreign central banks. 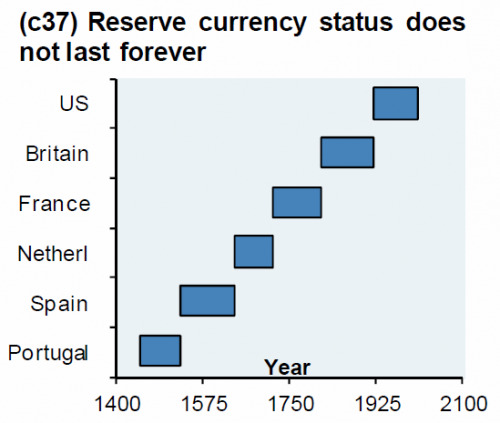 Which is probably why Moscow has relied on another reserve option that's popularity has endured for most of the history of human civilization: Gold. 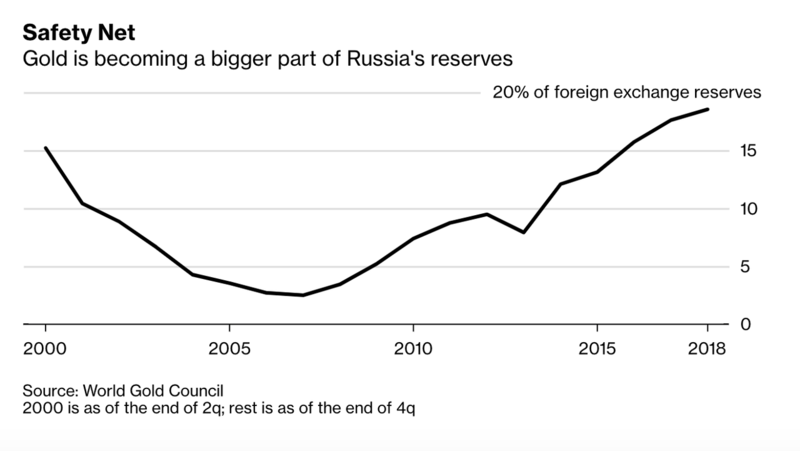 Gold reserves have nearly quadrupled over the past ten years, and that 2018 marked the most "ambitious year yet" for Russia gold-buying, which coincided with the Central Bank of Russia's mass-dumping of its Treasury holdings. Russia has single-handedly "put a floor" under the price of gold. 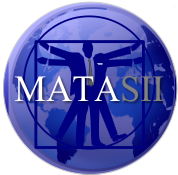 Though some suspect that, since the CBR is now a known quantity in international gold markets, it would need to markedly accelerate its purchases to have a material impact on the price. Though few expect Russia to stop buying now. Emmanuel Macron said in an interview late last year that Europe is too dependent on the greenback, declaring it "an issue of sovereignty" (this from one of the most ardently pro-EU politicians on the Continent). And last year, Poland and Hungary surprised the market by making the first substantial purchases of gold by EU member states in more than a decade. SOURCE: 03-31-19 - - "Why Russia Is Dumping Dollars And Buying Gold At The Fastest Pace In Decades"
Nine months ago, as US Treasury yields were drifting lower from a seven-year high reached in May of last year, we pointed out a curious development in the market for US sovereign debt that to our complete lack of surprise had been overlooked by the mainstream financial press: In April and May, Russia's central bank liquidated $81 billion in Treasurys, nearly its entire holdings. 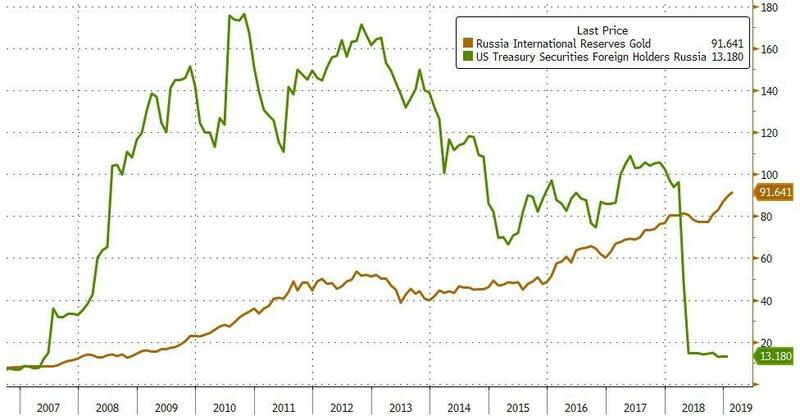 The drop was so significant, that Russia fell off the Treasurys list of the 30 or so largest Treasury holders. 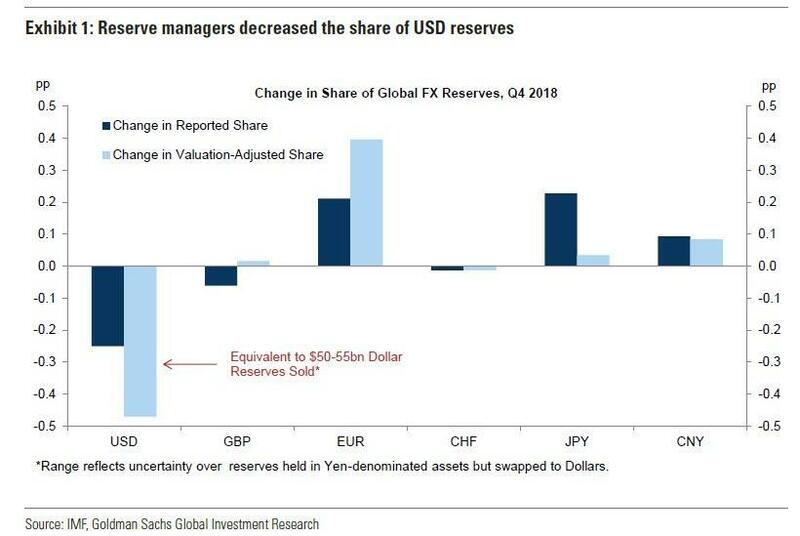 And in the months that have followed, as the US has imposed more economic sanctions and feuded with Putin over the fate of Venezuelan leader Nicolas Maduro, Vladimir Putin has turned instead to alternative reserves as the country's de-dollarization push continued. 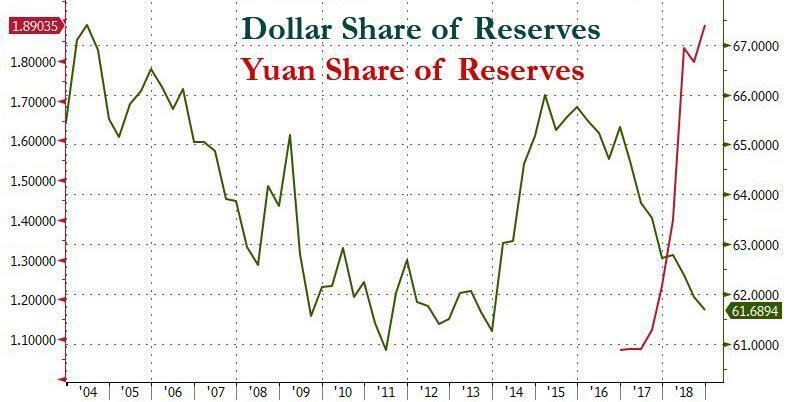 But given the yuan's still-limited convertibility, it has its limitations as a reliable reserve for foreign central banks. Which is probably why Moscow has relied on another reserve option that's popularity has endured for most of the history of human civilization: Gold. 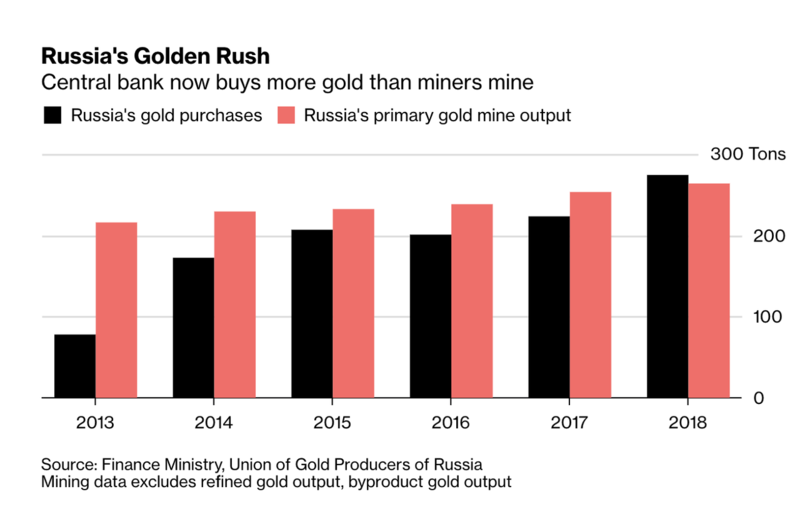 Data from the Russian central bank cited by Bloomberg show that its gold reserves have nearly quadrupled over the past ten years, and that 2018 marked the most "ambitious year yet" for Russia gold-buying, which coincided with the Central Bank of Russia's mass-dumping of its Treasury holdings. 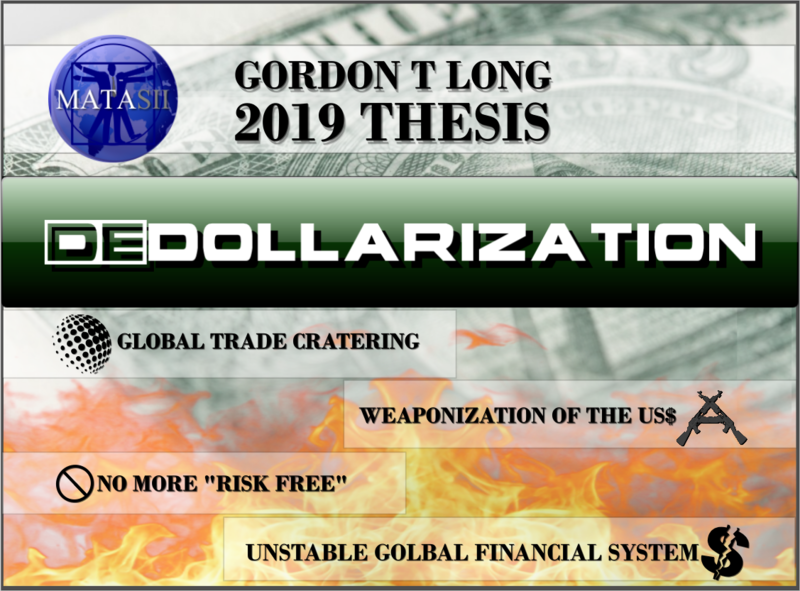 And in a rare, if muted, acknowledgement from the American financial press that de-dollarization is a contemporary threat that should be taken seriously, BBG said that "analysts, who have coined the term de-dollarization, speculate about the global economic impacts if more countries adopt a similar philosophy and what it could mean for the dollar’s desirability compared with other assets, such as gold or the Chinese yuan." While Russia's dependence on exporting commodities like gold means it must continue to depend, at least in part, on the greenback (three-quarters of Russia's $600 billion of trade is conducted in dollars, per BBG), this voracious gold buying is setting an example for other countries - in the west as well as in the east. Last year, Russia's gold buying outstripped its gold production for the first time. And as relations with the US continue to deteriorate as longstanding arms control treaties are torn up and belligerent rhetoric spouted by both Trump and Putin, the Russian central bank might start importing more gold, which could have a positive impact on the global price. Per two analysts, Russia has single-handedly "put a floor" under the price of gold. Though some suspect that, since the CBR is now a known quantity in international gold markets, it would need to markedly accelerate its purchases to have a material impact on the price. Though few expect Russia to stop buying now. Central bank buying has helped "strengthen gold from a weak hand to a strong hand" and supported gold prices in recent years, according to Ronald-Peter Stoeferle, managing partner at Liechtenstein-based asset manager Incrementum AG. Bullion has risen more than 20 percent since the start of 2016. It traded up 0.5 percent at $1,297.15 per ounce at 12:40 p.m. in London. "If it wasn’t for Russia’s central bank, last year would have been the worst year for gold buying in a decade, so it helped put a floor on the price," said Adrian Ash, head of research at gold brokerage BullionVault Ltd. "However, Russian buying is now well known so it would take a significant increase in their purchases to materially impact the gold price." But perhaps the most notable aspect of Putin's rhetoric about de-dollarization is how it's apparently influencing leaders of states that are still - at least nominally - friendly toward the US. French President Emmanuel Macron said in an interview late last year that Europe is too dependent on the greenback, declaring it "an issue of sovereignty" (this from one of the most ardently pro-EU politicians on the Continent). And last year, Poland and Hungary surprised the market by making the first substantial purchases of gold by EU member states in more than a decade.